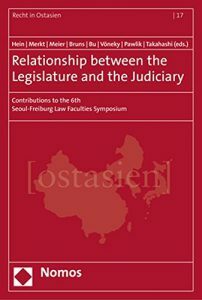 This volume (2017, 295 pp., € 79.00, ISBN 978-3-8487-3736-9) is a collection of edited papers (all in English) presented on the occasion of the 6th Seoul-Freiburg Law Faculties Symposium held in Freiburg (Germany) in June 2016. Since its inception in 1996, the cooperation and academic exchange between the Law Faculties of the Seoul National University (SNU) and the Albert-Ludwigs-Universität Freiburg has flourished and contributed substantially to the mutual understanding of legal thought and research in the two legal cultures and jurisdictions, keeping alive the old and precious tradition of maintaining a close relationship between Korean and German law. Like previous symposia, the 2016 Symposium on the „Relationship between Legislature and Judiciary“ was devoted to a rather broad and abstract subject which is of fundamental relevance for both countries, covering constitutional law, legal theory, private law (including private international law), criminal law, commercial law, and administrative law. The symposium was supported by the Thyssen Foundation (Cologne). The volume is edited by Jan von Hein, Hanno Merkt, Sonja Meier, Alexander Bruns, Yuanshi Bu, Silja Vöneky, Michael Pawlik, and Eiji Takahashi. It contains contributions by Un Jong Pak, Matthias Jestaedt, Ralf Poscher, Hong Sik Cho, Kye Joung Lee, Frank Schäfer, Jinsu Yune, Jan von Hein, Sank Won Lee, Ok-Rial Song, Boris Paal, Maximilian Haedicke, Seongwook Heo, and Dongjin Lee.